What if all the marital debt is in one party’s name? Suppose divorcing parties have no substantial assets, no children, both are employed and they have substantial debt spent for marital purposes which is all in one party’s name. What can the divorce court do? It depends on the jurisdiction. In D.C. and Virginia, the Court can allocate the debt and order each party to pay particular debts or portions of debts. 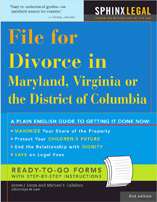 In Maryland, the court has no such authority and, in the foregoing example, the court could not do justice by considering marital debt in distributing marital property because there is no marital property. In the absence of an agreement, the debt-laden spouse would be stuck with all of the debt if this case were heard in Maryland. The court would not have authority to divide the debt or order each party to pay certain debts.